New project, new publication. You’re invited! Perpetual Imagination recently teamed up with Quabbin Quills, a non-profit organization in the North Quabbin area of Massachusetts. Our goal is to work with local writers on writing workshops and develop a curriculum for local authors to participate with others in bringing their work to the best level. 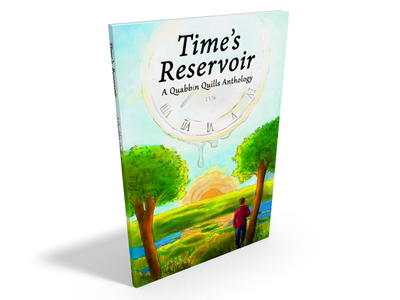 We then edited the result together to form our first anthology for Quabbin Quills, Time’s Reservoir. You can purchase a hard copy or Kindle edition of the anthology at Amazon. 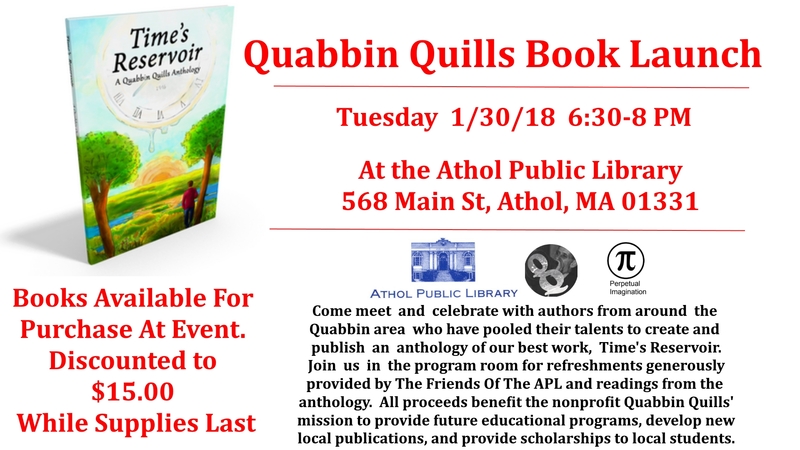 There is an upcoming opportunity to attend an event featuring readings from the authors of the anthology and speeches by the founders of the Quabbin Quills, Steve Piscitello and Garrett Zecker. The event will take place on January 30, 2018 from 6:30-8:00 PM at Athol Public Library in Athol, Massachusetts. Refreshments will be provided by the Friends of the Athol Public Library, and a limited number of books will be available for purchase at a discounted rate of $15 at the door. A purchase is not necessary to attend the event. This anthology is the first in a series, and future anthologies and updates will now be available in the “publications” section above under “Quabbin Quills”. This entry was posted in Uncategorized by gzecker. Bookmark the permalink.